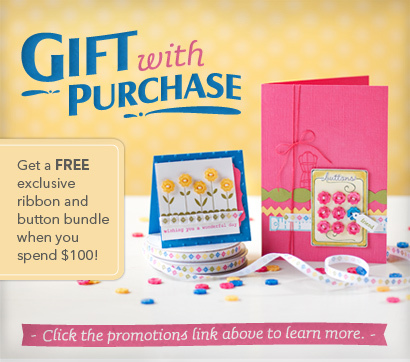 Just a reminder if you want to take advantage of this promotion that it ends on July 31. Email me with your order today! 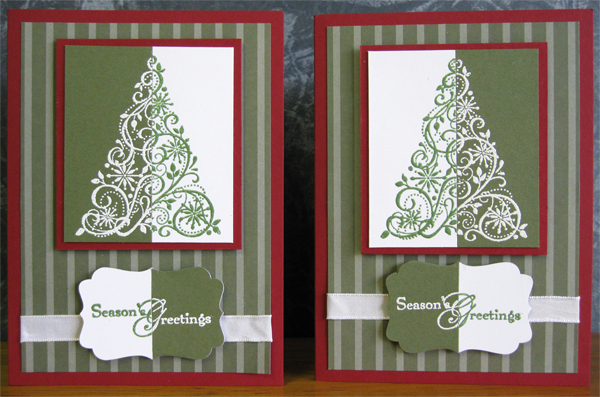 Continuing on with the Christmas theme, here's a way of creating two cards at the same time which are the same, but different. 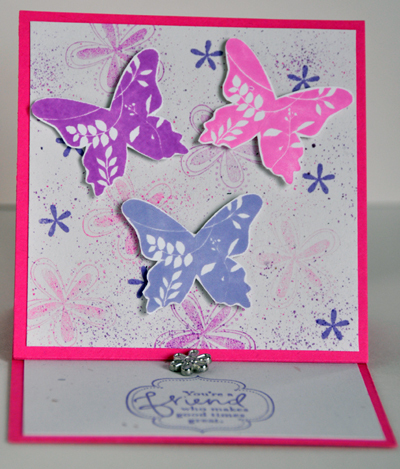 The technique here is called Split Negative, and you need two colours of embossing powder to match 2 colours of card stock. The Christmas Tree stamp from the Snow Swirled stamp set has been stamped twice with Versamark ink, on Whisper White and Always Artichoke card stock. The image on the white card was embossed with green embossing powder, and the image on the green card was embossed with white embossing powder. Then each image was cut in half and swapped so that you get half green on white and half white on green. The same technique has been used for the greeting, which was then punched with the Large Decorative Label punch. 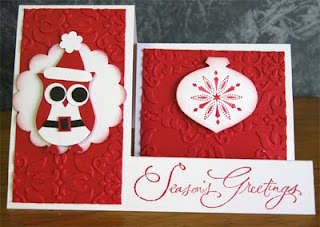 The card also uses some retired Christmas paper that coordinates well with the Cherry Cobbler red card base. A bit of Whisper White taffeta ribbon finishes off the card. No! 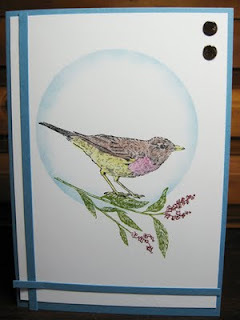 Why not get a head start on this year's cards and start making a couple per week from now on. That's what I'm doing, so that I'll have enough for my friends and family by the time the silly season comes around. Today's card is one designed by Heather, and uses the adorable Owl Punch as well as the Christmas Ornament and Scallop Circle punches. 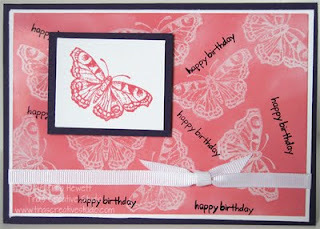 This is a Side-Step card, and the colours used are Real Red, Whisper White and Black. 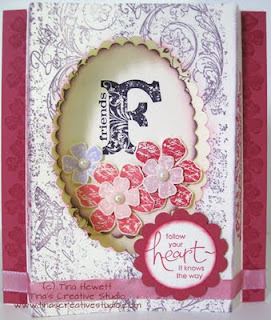 The stamp used on the Christmas Ornament is from the Snow Swirled stamp set, and the greeting is from the Many Merry Messages stamp set. Isn't the little owl cute? 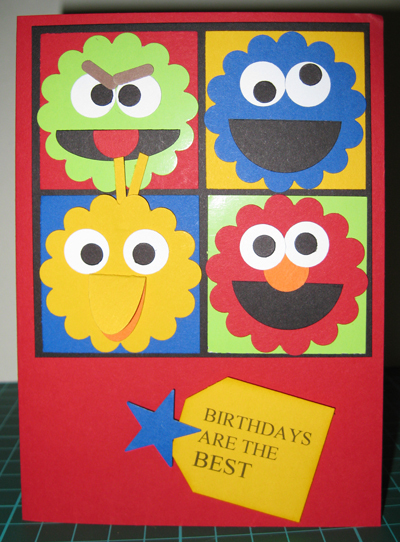 Here's another Twisted Easel card, this time with a single twist, so it's really quick and easy to make. Thanks to Tamara for the design. 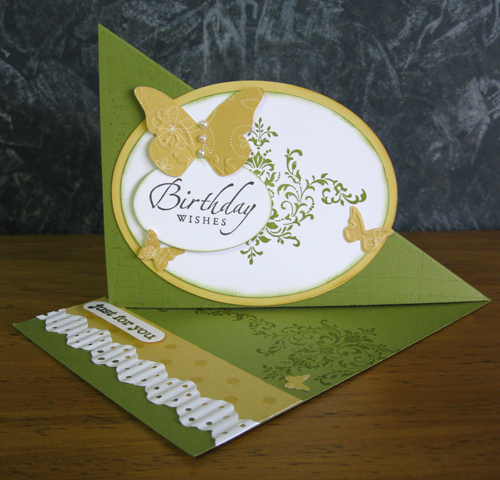 The colours used are Old Olive and So Saffron, the butterflies are cut and embossed using the Beautiful Wings Embosslits Die, and the stamp is from the 2011 Sale-A-Bration set called Bliss. The lace-like paper ribbon is created using the Eyelet Border punch on a strip of white card, which is then put through the Crimper. As the Bliss stamp set is retired, I can't order any more, but I do have 2 sets in stock, so if you would like to purchase one, just email me. 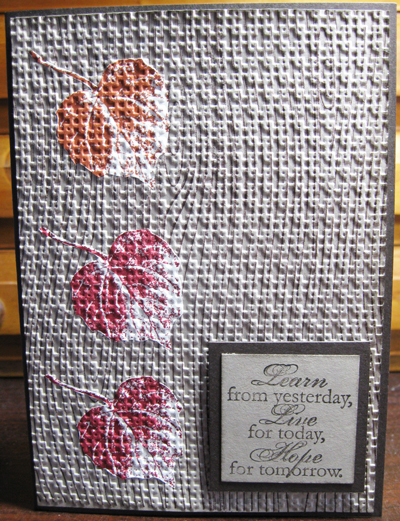 Today's card uses the lovely Nature Walk stamp set from the Autumn-Winter mini catalogue, which is finishing soon - 31st July, so if you would like this stamp set you need to order it now. A couple of faux brads were made up for the top right hand corner, and the bird was coloured in using a blender pen. 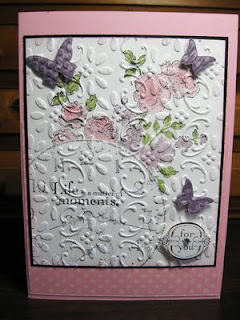 Today's card uses the lovely Vintage Vogue stamp set and the Very Vintage Jumbo Wheel. This is a Shadow Box card, which gives a 3-Dimensional effect and is a bit different from the standard folded card. I don't usually use the Vintage style in my cards, but I'm happy with how this turned out. 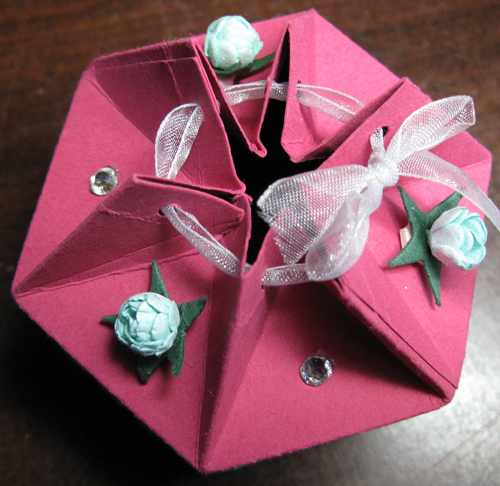 Accessories: White Taffeta Ribbon coloured with Rose Red ink, Basic Pearls, 1 3/8" Circle and 1 3/4" Scallop Circle punches. 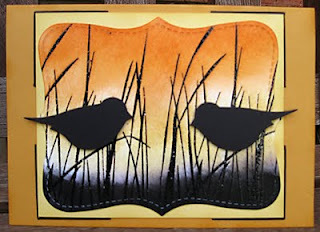 Today's card uses a technique called Versamark Resist, or Ghosting. Versamark is a clear ink which is used to give a watermark effect on plain card stock or to apply embossing powder to a stamped image. 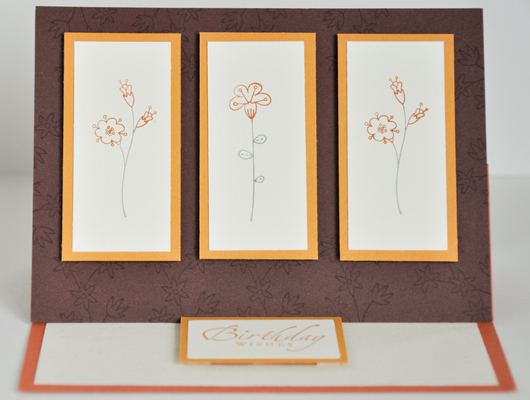 To get the ghosting effect you need to stamp your images using Versamark on Glossy White card stock. Here I've used the grass image from the Inspired By Nature stamp set and the butterfly is called All a Flutter. Once you've stamped your images, you colour the Glossy White card stock using dye based ink like Stampin Up's Classic Stamp pads, applying it either with a brayer or cotton ball, which is how I did mine. After applying the colour to the card, just buff the card using either a paper towel or clean cotton ball, to make the white really stand out. 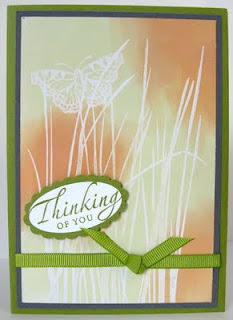 The sentiment is from Sincere Salutations stamp set, stamped onto Whisper White card stock with Old Olive ink. This is then punched out using the Large Oval Punch, and matted onto a piece of Old Olive card stock punched out with the Scallop Oval punch. 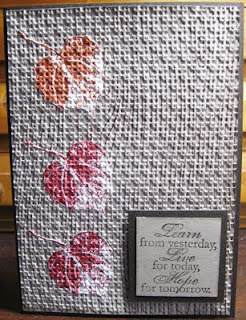 Tomorrow I'll show another card using this same technique. 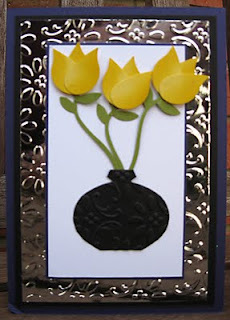 It's a quick and easy technique and you can make a card for any occasion using this technique. 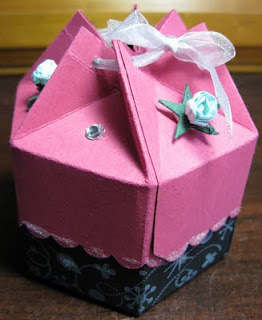 What is your "number one" papercrafting question? For example, something you're not sure of about a technique or how to use a product? Post your question in the comments section and I'll do my best to answer it! 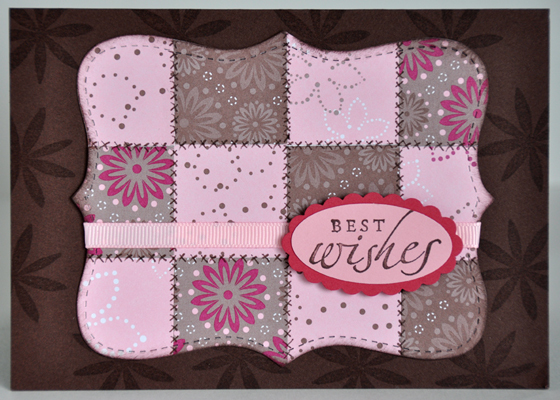 Today's card is a Double Twisted Easel Card, and it really is not as complicated as it looks. There's even not much stamping on it. 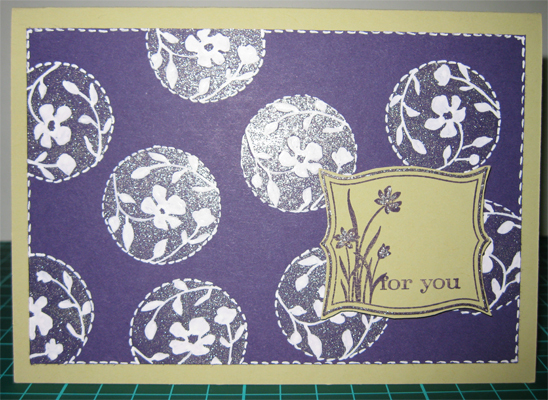 This one uses up some (retired) Designer Series Paper which is double sided. The sentiment is from On Your Birthday stamp set, and the butterfly is created using Beautiful Butterflies Bigz Die in the Big Shot die cutting machine. 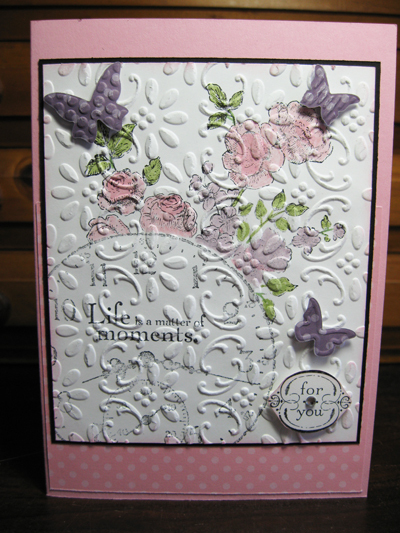 Once the butterflies are cut out with the die they are then embossed using the Vintage Wallpaper Textured Impressions Embossing Folder and put through the Big Shot machine. If you would like me to show you how to make these cards, just let me know and I'll run a class on them. Today's card is another easel card, this time one that folds down to 6" x 4". 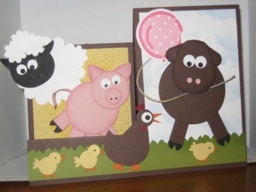 This one I call a Triptych easel card as it has 3 panels. The flower stamps used have been inked directly onto the rubber using Stampin Up's Brush Markers, so as to give the different colours. A Sentiment has been stamped and matted onto Mustard cardstock, and mounted on to the base of the card with Stampin Dimensionals (foam dots) to raise it and thus become the "propping up" mechanism for the card. 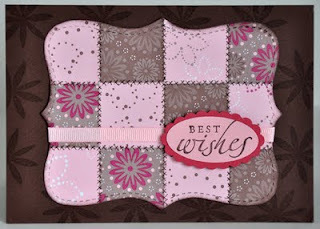 Let me know what you think of my cards by leaving me a comment below. Tomorrow I'll show you a more complicated version of the easel card. 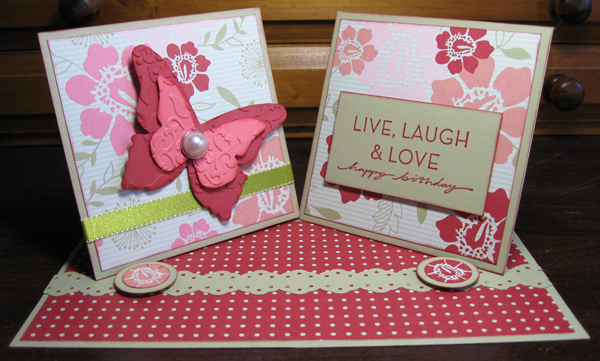 From 1-31 July, Stampin’ Up! is giving you a FREE exclusive accessories bundle when you spend $100 on your choice of Stampin’ Up! products. • One spool of white 1/4" (6 mm) grosgrain ribbon with repeating flower designs. Approximately 13,7 m.
• 48 flower buttons. 16 each in 3 colours (Daffodil Delight, Melon Mambo and Pacific Point). Approximately 1/2" (1,3 cm). Who doesn't like freebies! Place your order with me now to get these great accessories.